First Flight Prep: My POH, W&B, flight and annual checklists and flight test cards. In the interest of sharing with the community, here are the first revisions of my RV-14A Pilot's Operating Handbook (POH), flight and annual checklists and flight test cards. Please note, these were assembled prior to first flight and thus I anticipate they will all change during and after Phase I. As with all information on my site, it is being offered free for use. Feel free to copy and modify any or all of them to suit your needs. Links to the files are in the matrix below the image. I used OpenOffice to create each document. It's a free open source office suite. Below I include the documents in PDF, OpenOffice text (.odt) and Microsoft Word (.doc) formats (the .doc files may not preserve the full fidelity of original OpenOffice formatting). I will update the links with future versions as I write them. Following Phase 1 testing, v1.0 will be completed. It's best to save the .odt and .doc files directly to your computer/phone/tablet. If you instead view them in Google Docs' native viewer, they will be mangled on your screen. 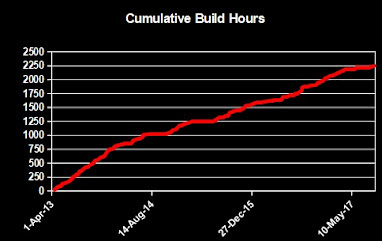 Update 21-Jan-19: Latest POH revision uploaded. Update 21-Nov-18: Annual Checklist added. Update 10-Jan-19: Added my W&B spreadsheet in both OpenOffice .ods and Microsoft Excel .xls formats. Much of the POH structure and some of its wording were stolen from a POH written by Brian and Brandi for N42BU, an RV-10. 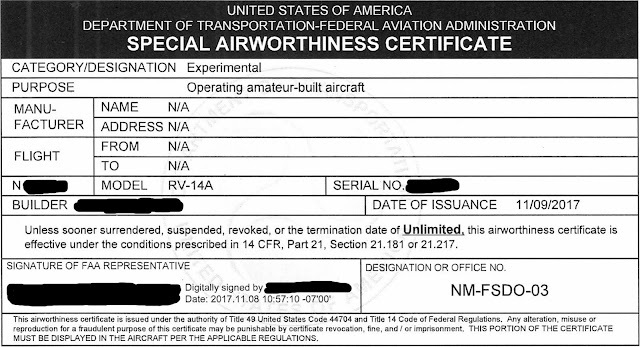 Most of the wording from the RV-14 plans' Chapter 2 serve as the first three subsections. I copied much of the checklist structure and wording found in N42BU's checklist. I copied the flight test card set offered by N169AK, modifying it as appropriate for my needs. 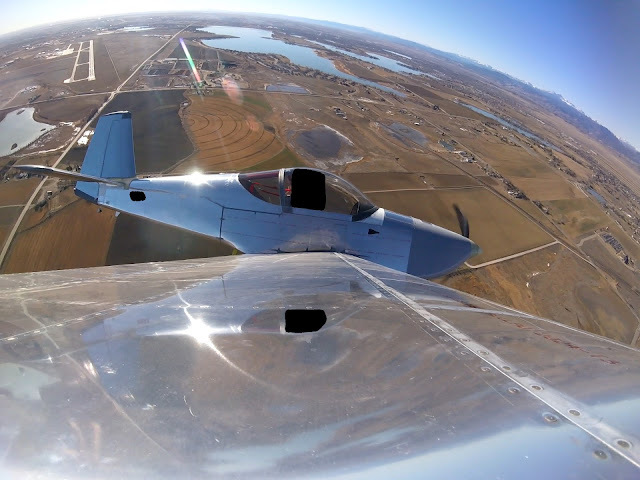 Tim Olson's N14YT annual checklist served as the starting point for mine. 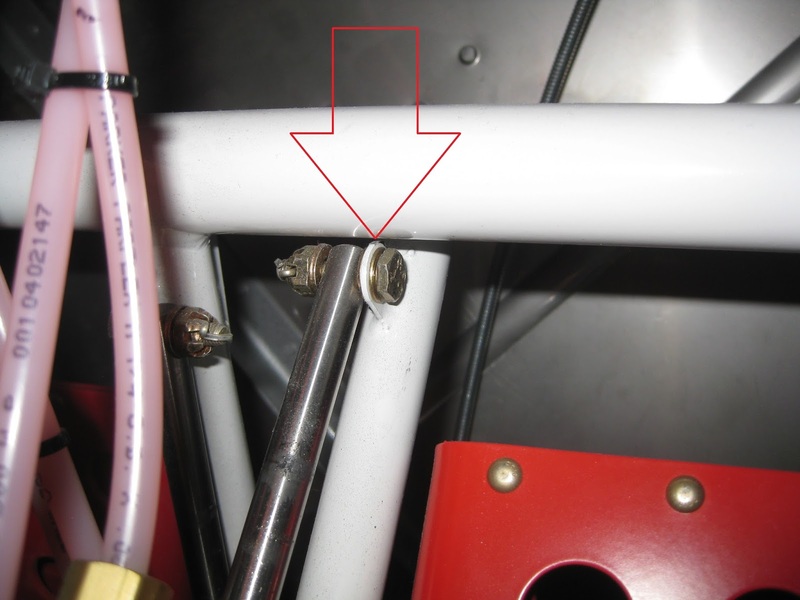 Fuselage: Rudder and Brake Systems. Longer rudder cable links. I have given away all of the extra sets I had. 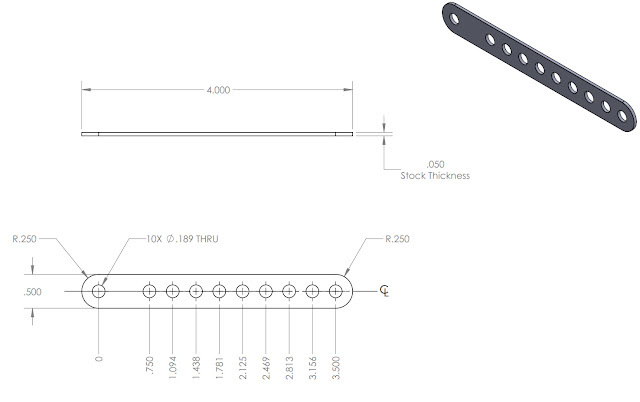 If you need a set, download the CAD drawing (consider updating the spacing as I explain below) and buy the steel stock material. Links to both are provided in this post. 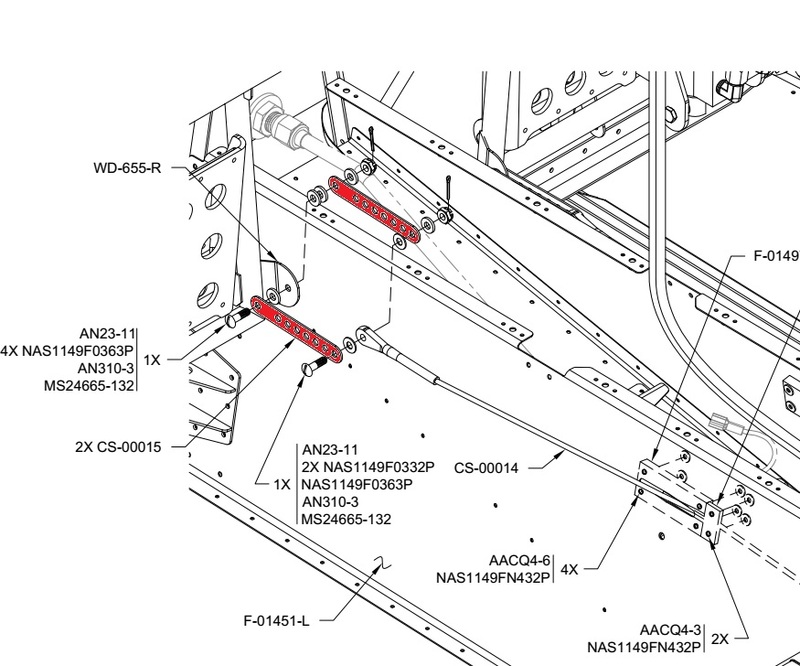 When I push the left pedal forward (which of course simultaneously pulls the right pedal aft), the "ear" on the WD-655-R pedal frame contacts the horizontal tube of the WD-655-L pedal, preventing the rudder from hitting its left stop. My pedals are in the forward-most position (closest to the firewall). This happens even with the proper rudder travel. 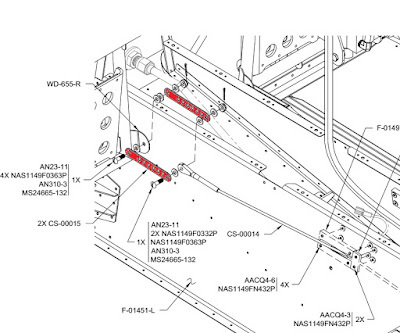 Below illustrates where the contact occurs as the right pedal is pulled aft and the left pedal pushed forward. You can see where the powder coating came off due to the contact. 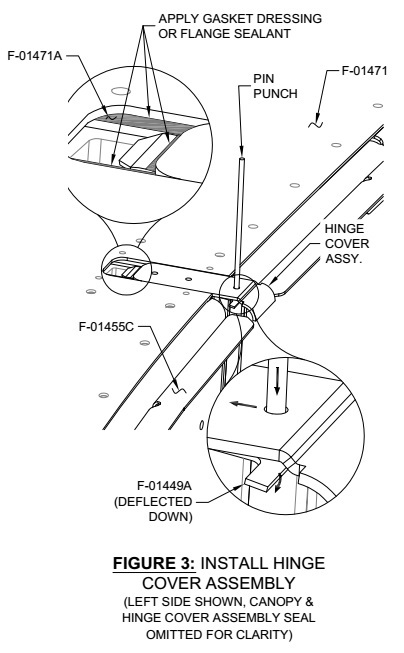 It appears as though the CS-00015 Cable Links need to be just slightly longer so that the cable need not be pulled forward so far (page 33-12). Or, alternatively, that the CS-00014 Rudder Cable needs to be slightly shorter. The latter solution is not practical. I consulted with Van's and they suggested fabricating longer Cable Links or reducing the rudder throw. However, to accomplish the latter would excessively limit the throw, so I deemed it undesirable. So I bought some inexpensive 0.05" 4130 steel stock (the same material and thickness that the kit's links are composed of) and whipped up new cable links in my CAD program (LibreCAD - free is good). I added two additional holes in comparison to the original cable links, giving me 9 holes rather than seven. I went ahead and dropped four full sets on there since the waterjet shop was going to charge me the shop minimum of $75 for the small job. Ultimately, the waterjet shop said they'd make as many as my material would permit. That turned out to be 18 Cable Links, so 4.5 sets. Below shows the links. 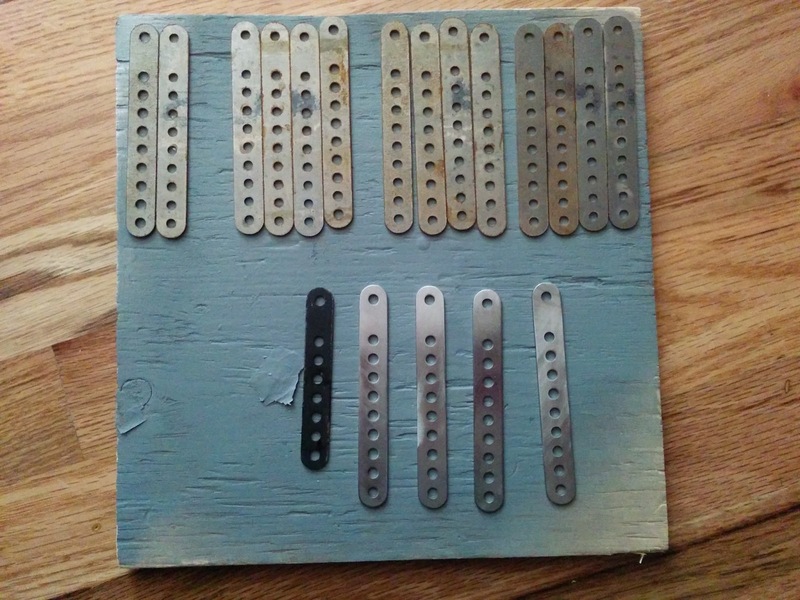 The top row are 14 links as they came from the shop (dirty, rusty and undersized holes). 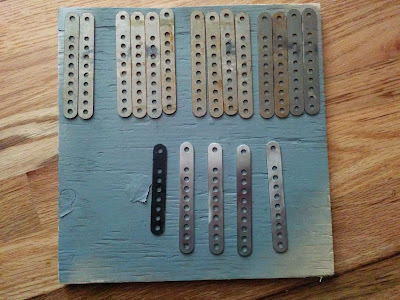 The bottom row shows on of the kit's Cable Links, followed by two sets of the longer links after final drilling to #12, deburring, sanding and cleaning for painting. If you need to fabricate your own, below are the final dimensions (ream to final size). These line up very well with the original, shorter cable links. 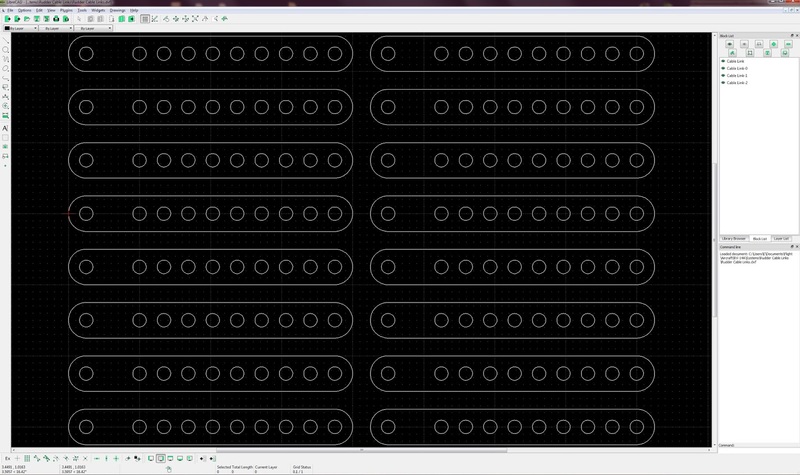 Also, here is the dxf file with 16 links (the hole diameters are undersized by 1/64" and the width of the links are 0.04" wider to account for waterjet tolerance). Holes are #12, so 0.189" diameter. The first hole is centered 1/4" from the edge. The second hole is center-to-center 0.75" from the first hole. Subsequent holes are spaced 11/32" (0.34375") center-to-center. I think the holes on the original parts are spaced 0.3445" center-to-center. That would place exactly 1/4" from the hole edge to next hole's center. The edges are half circles with a 0.25" radius, centered with the adjacent hole. A picture probably expresses that much more clearly.